Frohman's company No. 13 appeared in "Jane" at the Lansing last night. The play was preceded by garrulous and rather aimless farce entitled "The Great Mogul," which dealt with official communications from the geological department of Yale college and in which the leading lady spent the time that any healthy girl should spend in love making in analyzing minerals. The world is painfully familiar with stony heroines, but a female minerologist is going one step too far. This scientific curtain raiser scarcely needs condemnation; like most scientific things it will fall by its own weight. "Jane" is at all times and under all circumstances an enjoyable comedy. The climaxes are so strong and sudden that it would take a genius to make the play dull, and genius is not one of the faults of Mr. Gus Frohman's "Jane" company No. 13. Like a circus, "Jane" depends on its "grand entrees;" the entrance of Jane as Mrs. Shaketon in the first act, of the baby in the second, and of Pixton in the third. All these entrance climaxes are sudden, unexpected and they march to music. The only fault to be found with the play is that it is a delicate and artistic comedy and it requires rather artistic people to play it. This fact in a No. 13 company is a decided disadvantage. Last night's presentation of the play was in too low a key. "Jane" is written in the neatest kind of waltz time and it was played last night in can can measure. The whole company was provincial, like the territory in which they play. Mr. Thomas Reynolds seems a good enough farce com dian, but Shakelton was a gentleman if he was a rake. Mr. Reynolds made him a sort of horse jockey. Mr. Newcomb's William was anything but English. He was only an average American servant, indeed a little below the average. Miss Mamie Johnston made Jane altogether too refined. It takes the finest kind of a gentlewoman to play a servant well. Jane should be just a little loud, with a good deal of the strident quality, a genuine daughter of the people whose heart was better than her manners. Miss Johnston did very well in the famous table scene, but her uncouthness there was wholly incongruous with her mildness in the rest of the play. The redeeming features of the performance were R. H. Hicks as Kershaw and J. Brandon Tynan as Claude . Mr. Tynan, although he had only a minor role, was the most natural actor in the company and the only one who could make any pretention to polish. He is apparently a young man, but shows considerable promise. Even in that dismal curtain raiser Mr. Tynan played a rather trying part well. Miss Stevens also made a good head of the Pixton firm. If Mr. Gustave Frohman wishes to engage farce comedy people he should givem them farces to play. There was a time when the Frohman name insured the merit of a play, when of anything with the Frohman name attached we could say, "It is good," but time has changed this very much for the worse. The Frohmans are wealthy enough now to sell their name and it is just so much worse for the confiding public. The first recital of the artists' concert series, projected by Director Willard Kimball of the university conservatory of music, was given on a night when a large attendance could hardly have been expected. It was hoped, however, that earnest students of the best music to the number of three or four hundred would be present and as the main floor of the chapel was well filled it is evident that the series was launched last night under promising and satisfactory circumstances. A striking characteristic of Mr. Sieveking's playing is the rapid tempo that he is able to maintain. It was shown particularly in the third movement of the Beethoven sonata, in the Chopin etudes and in the polonaise. With all his impetuosity, he still plays with surpassing delicacy. Only a master of technique could play runs with so much velocity without blurring. The whole performance was refined and finished to a degree that apparently left nothing unaccomplished in the mastery of the keyboard. The admiration caused by the perfection of Mr. Sieveking's technique has been so unbounded that his hearers have hardly begun to discuss and appreciate his place as an interpreter. His rendition of the Beethoven sonata was most satisfactory. The dramatic element in the fantasie and the brilliancy of the polonaise were brought out effectively. His work through the program gave promise that he will prove in future recitals to be strong in interpretation. On of his most charming pieces last night was a poetic selection from Grieg, played in response to an encore. Mr. Sieveking was assisted in one number, the Grieg sonata, for piano and violin, by Mr. August Hagenow . The unsusual harmonies of the Norwegian music do not attract as a rule upon a first hearing, but these two artists made this a thoroughly enjoyable number. The Mendelssohn concert orchestra gave a promenade concert in representative hall of the capitol last night in the presence of a large crowd of friends and admirers. The hall was handsomely deocorated with bunting and the national colors. In the centre of the hall was arranged a platform or a dais for the large orchestra to sit upon and this too was decorated with the white and crimson colors which seemed to prevail in all parts of the hail. The audience was seated around the sides of the hall in the lobby, the hall proper being reserved for promenading and the drill by the Light infantry . It was about 8:30 when Director Howell picked up his baton and the march, "Apollo," commenced. While it was being rendered a number of the following patroncesses, in company with their husbands, promenaded around the hall, led by Adjutant-General Gage and Mrs. A. W. Jansen : Mesdames A. S. Raymond , R. H. Oakley , J. W. Winger , J. J. Imhoff , J. H. McMurtry , F. M. Hall , C. C. Burr , J. B. Wright , A. C. Ziemer , L. C. Richards , C. S. Lippincott , D. A. Campbell , H. R. Nissley , D. E. Thompson . The program was composed of musical selections by the orchestra. Delsarte exercises and an exhibition drill by the Lincoln Light infantry. The orchestra has only been organized a short time, but it is making rapid strides toward a prominent place in the estimation of musically inclined people of Lincoln. Several of its members were encored last night and the overture, "Orpheus," was particularly pleasing to the audience. Mr. Will S. Fulton won a recall on his tuba solo, "Beelzebub." The fans drill and special posings by a class of eleven young ladies in the light of a magic latern with dark background was one of the most pleasing features of the evening. The young ladies showed careful training and their posings were natural and very expressive. The drill by the Lincoln Light infantry was what it always is, as nearly perfect as steady, hard work under a competent drillmaster can make it. Frohman's company No. 13: The Frohman brothers, in addition to their stock companies in New York, sent out many touring companies, with casts appropriate to the size of the cities in which they would play. Gustave Frohman's no. 13 company had several actors just at the beginning of their careers; a few, such as Thomas Reynolds and Brandon Tynan, would become successful, if not long-remembered, actors. Jane: Harry Nicholls and W. Lestocq adapted Jane from a French farce, Prête-moi ta femme, according to the New York Times review, which called it an "ordinary farce," albeit with a few clever scenes; the original cast starred Johnstone Bennett as Jane (9 August and 1 August 1894). In the play Jane pretends to be her young employer's wife, although she is already married "for the double purpose of acquiring a competency and doing her frivolous young employer a good turn" (19 December 1893). The Great Mogul: Neither the New York Times drama review index nor Odell's Annals of the New York Stage mention this play, although a musical of this name was staged in 1881. Yale: In 1701 a charter was granted to a college in New Haven, Connecticut; it was named Yale College in 1718 after a Welsh benefactor who also donated books and a portrait of King George I. It grew rapidly, always rivaling Harvard. Yale's Graduate School of Arts and Sciences (founded 1847) awarded the first Ph.D. in the United States in 1861. Jane: In Nicholls and Lestocq's Jane (1891), Jane is the married servant girl who pretends to be married to her young employer to help him fool the rich old man who has power over him. The role was originally played by Johnstone Bennett. Mrs. Shakleton: In Nicholls and Lestocq's Jane (1891), Jane's name as she poses as the wife of her employer. Pixton: In Nicholls and Lestocq's Jane (1891), Pixton is the old man whom Jane and her employer must fool in order to get money. The role was played by M.C. Daly in the original New York production. waltz time: Waltz time, also known as three-quarter time, has three beats to a measure, with each quarter note equaling one beat. can-can measure: The can-can is a lively dance in two-four time: it has two beats to a measure, each quarter note equaling one beat. Mr. Thomas Reynolds: By 1903, actor Thomas Reynolds was the leading comedian with the American Theatre stock company in New York; he appeared on Broadway stages until 1917. Shakleton: In Nicholls and Lestocq's Jane (1891), Jane's employer needs her to pretend to be his wife. The role was played by Paul Arthur in the original New York production. Mr. Newcomb: Possibly the Robert Newcomb who played in The Argyle Case in 1912, the only actor of this surname in this period in the New York Times drama review index. Odell's Annals of the New York Stage does not mention any actor of this surname in the early 1890s. An actor of this name also appeared in two silent films in 1915 and 1916. William: In Nicholls and Lestocq's Jane, William is Jane's real husband; he is a servant also. The role was played by R. F. Cotton in the original New York production. Miss Mamie Johnston: The New York Times drama review index notes that an actress of this name played in a private subscription production of Mary E. Wilkins' Giles Corey, Yeoman in April 1893. Odell's Annals of the New York Stage does not mention any actress of this name. Famous table scene: The New York Times review mentioned a luncheon episode as one of the funniest scenes in the play (9 August 1891). R. H. Hicks: Neither the New York Times drama review index nor Odell's Annals of the New York Stage mention an actor of this name. Kershaw: Kershaw is a character in Nicholls and Lestocq's Jane (1891). J. Brandon Tynan: Actor and playwright Brandon Tynan (1875-1967) was born in Dublin, the son of P.J.P. Tynan, and came to the US when he was about seven. Odell mentions him in a production of a Maeterlinck play put on by Sargent's Academy of Dramatic Art in January 1894; he had a minor role in a professional Broadway production, A Woman's Revenge in February 1894. He dropped the J. about 1900 and went on to a long Broadway career, touring with Nazimova's company from 1907 to 1910 or 1911, appearing in the Ziegfield Follies for several years in the 1920s, and in many other productions until 1936. He wrote several plays on Irish themes, directing them and starring in them as well, including Robert Emmet (1902) and The Melody of Youth (1916); the New York Times review said of the latter play that with it he came into his own as actor and playwright. Tynan appeared in three silent films in the mid-1920s, but played mostly minor roles in twenty sound films between 1937 and 1941. His first wife was Caroline Whyte (d. 1918); he married actress Lily Cahill (1885-1955) in 1920. Claude: Claude is a character in Nicholls and Lestocq's Jane (1891). Miss Frances Stevens: Possibly actress Frances Stevens, who had played in an 1892 production of Jane, starring Elaine Ellison. Frances Stevens went on to a Broadway career, appearing in eight plays between 1898 and 1906. Another possibility is Emma Maddern Stevens, a niece of Minnie Maddern Fiske, who had minor roles in two Broadway plays in 1894 and 1895. Pixton firm: The Pixton firm is a fictional organization in Nicholls and Lestocq's Jane (1891). Mr. Willard Kimball: Willard Kimball (1854-1939), although not a musician himself, founded a private conservatory, the University School of Music in 1894, in affiliation with the University of Nebraska, which later purchased it. He was the musical director for the 1898 Trans-Mississippi Exposition in Omaha, and brought many outstanding musicians to Nebraska to teach or to perform. Sonata Op.27, no. 2: Beethoven's Piano Sonata No. 14, Op.27, no. 2 in C sharp minor (1801) was given the name of the "Moonlight" sonata in 1832 by a poet who compared the first movement to moonlight shining on a lake. Op. 10, no. 12: The twelfth of Chopin's first set of etudes, Op. 10, is known as the Revolutionary Etude; it was composed about 1831, about the time of a failed Polish uprising against Russia. The twelve etudes in the set were dedicated to Franz Liszt. Op. 10, no. 5: Chopin's etude, Op. 10, no. 5 in G flat major, is known as the "Black key etude" because the rapid triplets in the right hand are played almost exclusively on the black keys—there is one note played on a white key, F natural. Fantasie in F minor: Chopin's Fantasie in F minor, op. 49, was composed in 1841. Liszt is said to have described the fantasie as a musical description of Chopin's relationship with George Sand. Sonata op 46, piano and violin: Grieg wrote three sonatas for violin and piano; the third sonata, in C minor, op. 45 (1887), used Norwegian folk melodies and became one of his most popular concert pieces. Second polonaise: Franz Liszt's two polonaises were published in 1852; the Polonaise No. 2 is in E flat major. Mr. August Hagenow: August Hagenow came to Lincoln from Chicago in 1886; he was a violinist, but also conducted bands and orchestras in Lincoln. He joined the faculty of O. 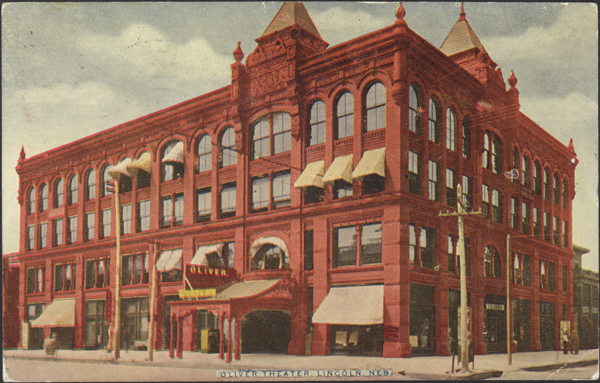 B. Howell's Nebraska Conservatory of Music in 1889, the same year he married Emma S. Seifert. In January 1894 he opened the Hagenow School of Music, but was bought out by Willard Kimball of the University School of Music in June 1894. Hagenow joined the faculty of the University School of Music, becoming director of the university band from 1903 to 1911. Mendelssohn concert orchestra: Lincoln's Mendelssohn concert orchestra had been recently organized, as Cather notes, and was probably not long lived; Seymour does not mention it in her history of music in Lincoln. It may have been conducted by August Hagenow, violinist and conductor, and an admirer of Mendelssohn: Cather reviewed an all-Mendelssohn piano concert by Hagenow, calling the composer "weak and childish" (10 February 1895). Promenade concert: At a promenade concert, the audience, or most of it, is not seated and is free to move around as the music plays. Sometimes the movement took the form of processional marching; sometimes it came closer to dancing. In times and places where dancing was often condemned, such as in Lincoln in the 1890s, the promenade concert could become a dance or ball (a 'prom') depending on the music played. Representative hall: The Nebraska legislature's house of representatives met in this chamber in the state capitol. Capitol building: In 1881 work began on the second Nebraska state capitol building, replacing the crumbling 1867 capitol. It stood on the same site as the present capitol (1922-32) on the block bounded by 14th and 16th streets, and H and K streets. The second capitol was finished in 1888, and was classical in style, modeled, like many other state capitols, on the national capitol in Washington, D.C. The Lancaster County section of the 1890-91 Nebraska State Gazetteer described the new building as: "a grand structure of pure Grecian architecture, with a central building, surmounted by an imposing dome, and two wings, each three stories in height, the walls being of brick with beautiful facing of oolitic limestone. The interior is tastefully finished in a style to correspond with the magnificence of the building. It cost $600,000." 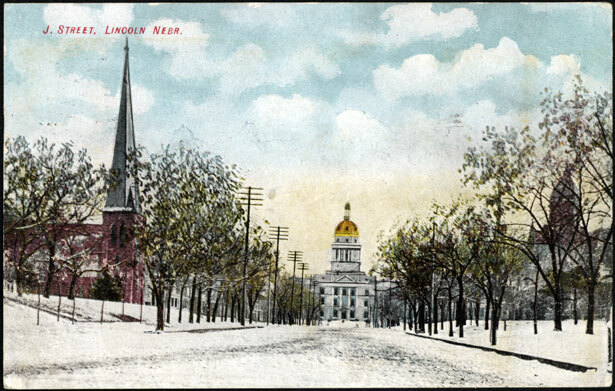 Postcard of J Street looking south to the Capitol Building, Lincoln, Nebraska, c. 1900. Nebraska State Capital building Looking Southeast from Burr's Block, Lincoln, Nebraska, late nineteenth century. The capitol building is visible in the background. Apollo March: The Apollo March in E flat major (1865) for military band has been attributed to Anton Bruckner (1824-1896), although some sources say it is actually by Keler Bela (1820-1882). Adjutant-General Gage: James D. Gage of Naponee, Franklin County (1842-) was Adjutant-General of the Nebraska National Guard from 1893 to 1895. He served over 6 years in Union army, 1861-1867, in the Quartermaster Corp and as superintendent of the Harbor of Richmond after the Civil War. He went to Chicago, then Iowa, then to Nebraska, going into the stock business, banking, and milling. He married Estella Douglass in 1874. Mrs. Albert W. Jansen: Lincoln furniture dealer Albert W. Jansen came to Lincoln c. 1880 and had a store at 107 N. 9th ; he lived at 2509 N St. in 1894. [Mrs.] Aaron S. Raymond: Lincoln wholesale druggist Aaron S. Raymond (1843-1922) was born in New York, and his wife Mary Elizabeth (Mollie) Baird Raymond (1855-1931) was born in Illinois); they were married in 1880 and had four children, of whom three were still living at the time of the 1900 census. They lived at 1642 R St. in Lincoln. Mrs. Raymond's memoirs tell of hiring Cather to teach her and her friend, Mrs. J. J. Imhoff, story-writing. [Mrs.] Roland H. Oakley: Lincoln coal dealer Roland H. Oakley, who came to Lincoln from New York about 1880, was also an agent for the Union Pacific Railroad in the 1880s. He and his wife, Ada Owen, lived at 16th and M street. [Mrs.] J. W. Winger: Lincoln dry goods and grocery dealer J.W. Winger (b. 1842) and his wife Evangeline (b. 1847) came from Pennsylvania to Lincoln around 1880; the family of Lincoln lived at 1248 J St. One of their six children, Florence, graduated with Cather in the class of 1895. [Mrs.] Joseph J. Imhoff: Lincoln hotel keeper and banker Joseph J. Imhoff (b. 1835) and his wife Mary (b. 1845) had two sons and two daughters. They came from Pennsylvania about 1880, operating the Commercial Hotel at the southwest corner of 11th and P St.
[Mrs.] James H. McMurtry: Lincoln real estate man James H. McMurtry (b. 1845) and his wife Amanda (b. 1847) were both born in Indiana. They were married in 1870 and came from Lafayette, Indiana, to Lincoln around 1880; they lived at the southwest corner of 11th and J. [Mrs.] Frank M. Hall: Lincoln lawyer Frank M. Hall (1852-1928), a partner with T.M. Marquette and J. W. Deweese, and his wife Anna E. Hall (1857-1928) were married in 1883 and lived at 1040 D St. in the 1890s. They were members of the Haydon Art Club and became collectors of contemporary American art, leaving their collection and an endowment to the Haydon's successor, the Nebraska Art Association. C. C. Burr: Carlos C. Burr (1846-1927) was a lawyer and Lincoln, Nebraska, pioneer. He and his wife Mary (Smith) Burr also had a real estate and loan company. C. C. Burr had built the Burr block at 12th and O St., then Lincoln's tallest building; he was mayor of Lincoln, 1885-1887, and served two terms in the state legislature. The family lived at 1530 L St until they left Nebraska c. 1895. [Mrs.] J. B. Wright: Lincoln grain dealer and banker John B. Wright (1845-1925) married his wife, Jessie, in 1890. They had one son, John C. Wright, about 1897. Wright was mayor of Lincoln in 1880-81 and president of the Columbia National Bank c. 1894-1900. The family lived at 1421 H St.
[Mrs.] Arthur C. Ziemer: Arthur C. Ziemer was born in Ohio c. 1848, coming to Lincoln from Cleveland c. 1880, where he was the Burlington Railroad's ticket agent for many years. His second wife, Julia E Ziemer, married him in 1885; they lived at 1410 N St. By 1910 Ziemer was a practitioner of Christian Science. [Mrs.] Lewis Cass Richards: Lincoln banker and investor Lewis Cass Richards (b. 1834) was born in Michigan and came to Nebraska from Washington, Iowa, in the 1870s with his brother, J.R. Richards, to form the State National Bank. Richards' wife, Mazie Boome, was born in Iowa in 1850; they were married about 1877 and had one daughter, Mable (b. 1878). The family lived at 1340 R St.
[Mrs.] Charles S. Lippincott: Mrs. Lippincott was the wife of Charles S. Lippincott, assistant cashier of the First National Bank in Lincoln; the couple lived at 2100 Washington Street at this time. [Mrs.] David A. Campbell: David A. Campbell was the state librarian in the mid 1890s; he and his wife lived at 1700 K street. [Mrs.] Harry R. Nissley: Lincoln merchant Harry R. Nissley was a partner in the firm of Nissley & Co., which ran a general merchandise store at 10th and O St. He and his wife lived at 427 S. 15th St; they moved from Lincoln c. 1900. [Mrs.] David Eugene Thompson: David Eugene Thompson (1854-1942) was born in Michigan and came to Nebraska in the 1870s; he rose from a position as brakeman on the Burlington railroad to train master in 1880, then general superintendent of the Burlington west of the Missouri by 1886. He resigned to go into the Lincoln Gas and Electric Light company, where he made a fortune that was estimated at a million dollars in 1900. 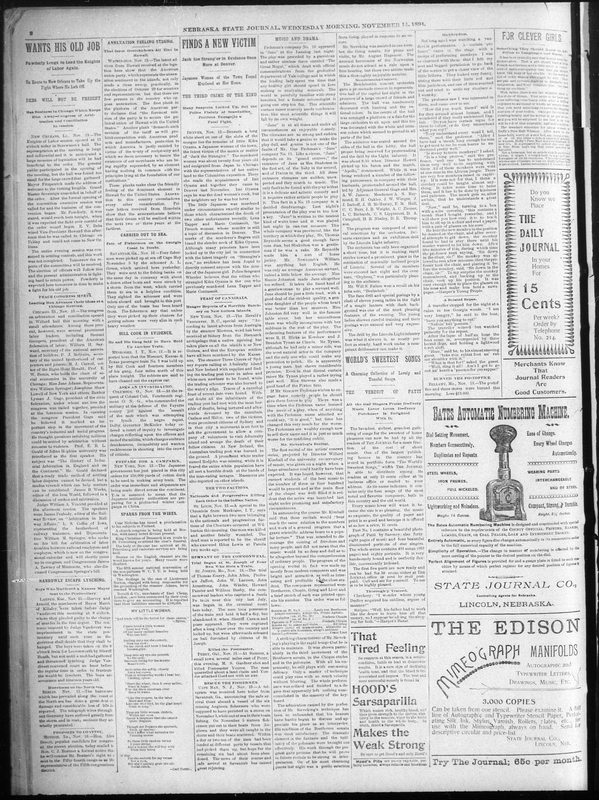 He was president of the Famers and Merchants Insurance Company in 1894, and founded the Lincoln Star newspaper in 1902. The 1900 census describes him as a "capitalist;" his house at 1445 H Street would soon become the official governor's mansion for the state of Nebraska. Thompson was active in Republican politics, running for the Senate in 1898 and 1900; he served as US minister to Brazil 1902-1905, and as ambassador to Brazil in 1905 and to Mexico in 1906-09. Thompson was married four times; in 1890 he married a woman (identified only as "Mrs. D.E." in the 1900 census) who was born in 1868 in Illinois. Thompson had become acquainted with Silas Garber, founder of Red Cloud and governor of Nebraska in the early 1870s (and prototype for Captain Forrester in Cather's A Lost Lady); in 1921 he married Garber's granddaughter, Gladys Dana Garber (1895-1928), his fourth wife. François Delsarte: François Delsarte (1811-1871) had his singing voice damaged by bad training. He dedicated himself to a scientific study, as he believed, of the principles of aesthetics and how emotions are expressed through the voice and the body. Many great actors and actresses consulted him; his ideas were brought to the U.S. by Mackaye Steele. One of Steele's associates, Gertrude Stebbins, published The Delsarte System of Expression in 1885. Delsarte's teachings were popularized as a system of conventionalized gestures and poses. Orpheus Overture,: Possibly the overture to Jacques Offenbach's 1858 satiric opera Orphée aux Enfers (Orpheus in the Underworld), a popular concert piece. Mr. William S. Fulton: Possibly the William S. Fulton who roomed at the Conservatory of Music in 1895; his occupation was listed as "painter" in the Lincoln city directory. He may have been a son of Sarah Fulton, who was listed as the widow of William Fulton. tuba solo, Beelzebub: Andrea Catozzi, a New England tuba player, composed "Beelzebub: Air Varié" (1886) for a contest for solo instruments sponsored by the Carl Fischer Company. It is sometimes arranged with band or piano accompaniment. fan drill: In a fan drill, the performers open, close, and move their fans in a rhythmic, coordinated manner reminiscent of a military drill team with its rifles.